Hey guys we are back with another video. 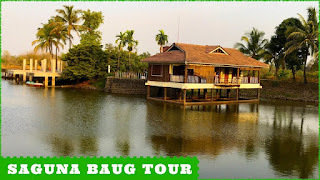 This time we visited Saguna Baug an agro tourism farmhouse located in Neral. It is around 80kms away from Mumbai. It is resort where you can experience farm life. It has various activities like swimming in river, milking cow, tilapia fish farming etc... Also some paid adventure activities like flying fox, rope climbing etc..
1. The farmhouse is huge you can consider renting a cycle to explore the place. 2. The Pond house is is very good and accommodate around 8 people. 3. This is not a luxury resort, It is a place to experience farm life. 5. Carry extra clothes if you are planning to swim in river. 6. Reaching via train and is economical option.